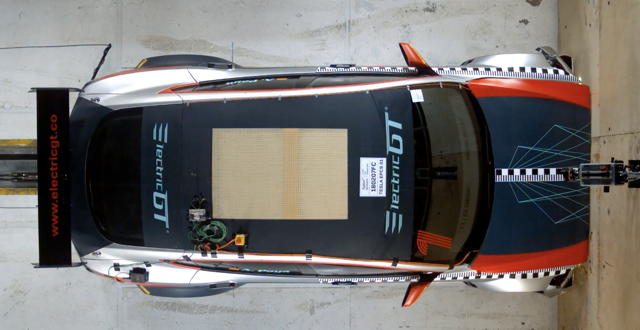 Electric GT Holdings Inc. has announced that its all-electric race car, the Tesla Model S P100D, has passed its official crash test ahead of the inaugural season of the Electric Production Car Series (EPCS). The crash test was carried out by IDIADA (Institute for Applied Automotive Research) at its facility in Barcelona. The crash test is mandated by the FIA as part of the homologation of the race car ahead of the inaugural season in 2018. During the official test, the race car, equipped with the latest OMP safety equipment, experienced a frontal collision against a rigid barrier - a block of concrete that weighs 130 tonnes covered with a 19mm wooden plate - at a speed of 14 m/s (50.4 kph). The car’s high-voltage battery was active and charged according to manufacturer and FIA instructions and had an 88 kg dummy in the driver's seat. The weight of the vehicle was 1,720 kg, representing the maximum race weight of the race car plus the weight of the dummy and a 25 kg data acquisition system. IDIADA officials measured the acceleration of the dummy and vehicle during the crash. After the collision, officials also measured the protection against electrolyte spill and electric shock, plus static deformation in different points of the vehicle. Up to 20 drivers will race the fully race-prepared Tesla Model S P100D in the Electric Production Car Series, commencing in 2018, running on bespoke Pirelli tyres and equipped with the latest OMP safety equipment and Alcon brakes. Rounds will consist of a 20-minute practice session, a 60-minute qualifying heat, a day race (60km) and a dusk race (60km). Race weekend will also include the eKarting Series and the eSports Championship. Each round of the Championship will be a weekend-long festival of technology and innovation for sustainability, in and around the circuits. Fans will be able to stream races via Periscope, Twitch and YouTube, as well as interact directly with the teams using social media platforms. Electric GT Holdings Inc. CEO, Mark Gemmell said: “We are very pleased to have successfully passed our crash test. While there was no doubt as to the safety of the race car we have built, thorough safety testing is always a priority.